Summers have started and so our planning. 😉 Planning to visit places, to eat out or to drink some refreshing non-alcoholic tropical drinks. Such drinks add a kick to our usual dull life. They boost our system to start a new day in our life. While choosing pineapple , make sure you choose the ripe one with no bruises and soft spots. It should be fragrant. 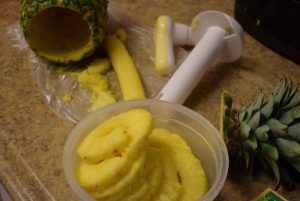 Also I bought a pineapple corer from Walmart which has made my tough job easier. I recommend to buy one if you could get it nearby. I first tried this simple “virgin Mojito” at a restaurant called ‘Sakoon’. Since then, I lived in awe of the drink, its taste and its preparation. Like many others, I thought its useless to try a non-alcoholic drink which would need a lot of hard work. But I was wrong. 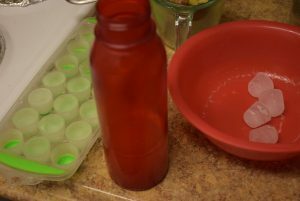 Yes this drink is almost instant and easy to make and serve. It could be prepared halfway in advance and stored in refrigerator for 2-3 days. So now lets begin with another fruity recipe. 1. 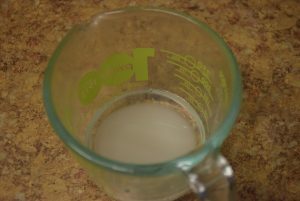 Boil water in a pan or heat it in a glass container in microwave. 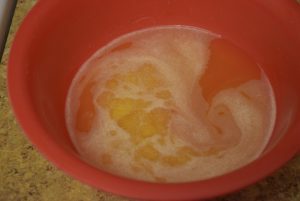 Add sugar in it and dissolve it thoroughly. 2. Now add 2 -3 mint leaves (washed) to it and keep aside for 15-20 mins or till it comes to room temperature again. 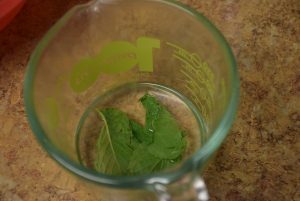 This helps in infusing the mint flavor in the drink. Just remember to take out the leaves after 15 mins or it will absorb a strong flavor. 3. 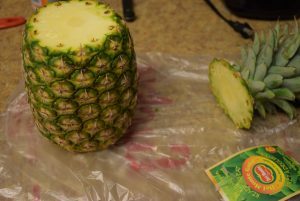 Cut the top of the pineapple with a sharp serrated knife. 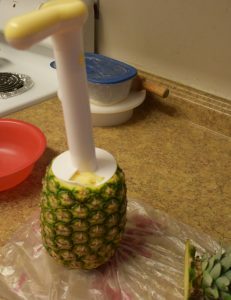 Use a pineapple corer (brand :progressive) now. For this place it vertically on the flat top of the pineapple just in the center. 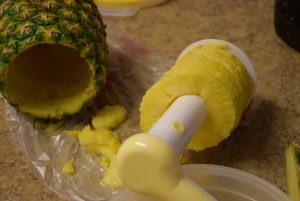 Try rotating it in one direction so that it goes inside the pineapple slowly. 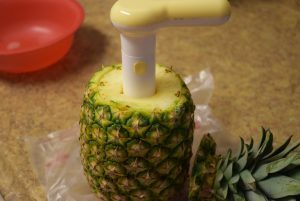 Keep on rotating with hand till it reaches the bottom part of the pineapple. Twist it a little more such that it cuts through the bottom part too. Now pull it out with all your strength. You will get the whole pineapple slices with core and hard skin left behind. 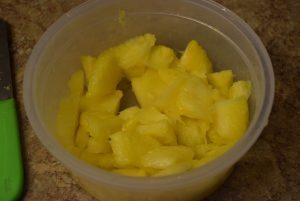 If you don’t have it, just slice off the skin with knife and then separate the core again by slicing the pineapple wedges. 4. 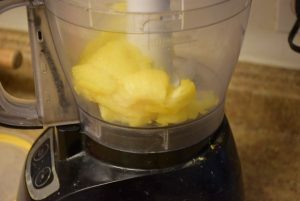 Next puree the pineapple , save 1 to 2 piece for garnishing if you like. Strain it through a fine mesh and add the juice collected below to the mix above(mint leaves are already removed).Chill it. You can store this mix in large quantity and prepare ahead of time for 2 to 3 days. 5. 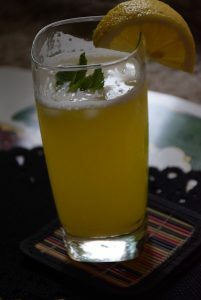 When you are ready to serve, muddle 1-2 pieces of pineapple , a sprig of mint leaf, a lemon wedge, ice cubes in a shaker. I however omitted pineapple chunks here. 6. 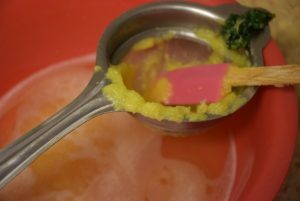 Add the pineapple-mint puree to it and shake till you see a frothy layer. 7. 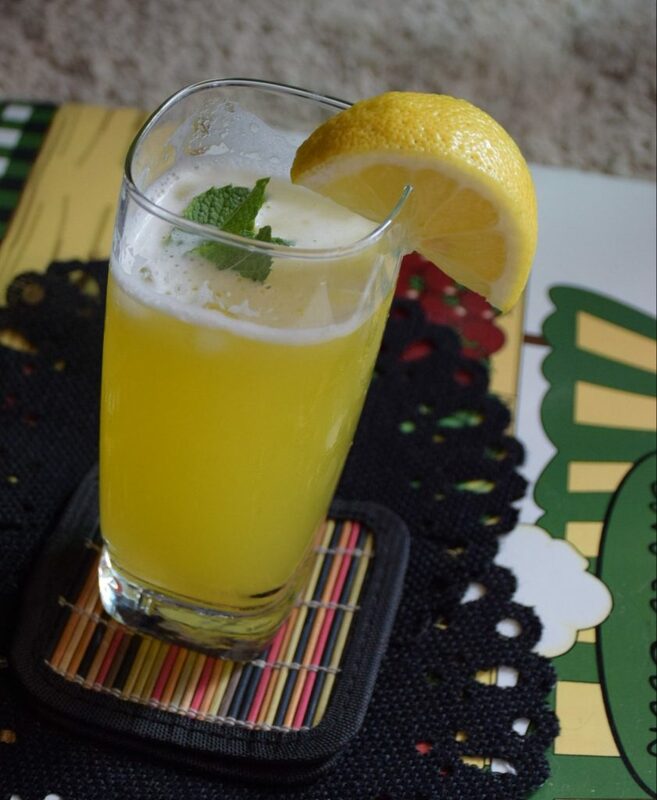 Lastly top it with club soda or any colorless, sugar-free carbonated drink to add fizz in the serving glass. 8. 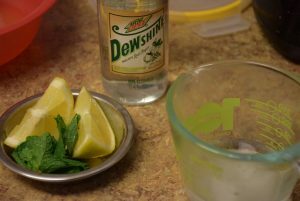 Serve right away with a lemon wedge and mint sprig for garnishing. Enjoy this Mojito with your favourite evening snack like Dabeli, Falafel, chiwda, sizzlers, veg puffs etc. Enjoy this non-alcoholic, healthy , refreshing, tropical summer drink on a vacation with your family. Since this is the first Mojito I have tried, any suggestion or advice is heartily welcome. If you give it a try, please leave your feedback in the comments below. 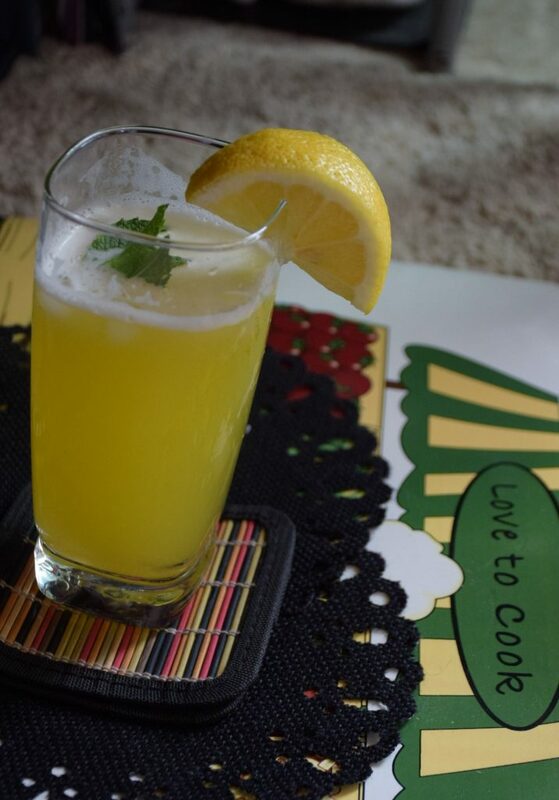 This entry was posted in Drinks, Food, Recipes and tagged ananaas, anannas, carbonated drink, Carenshare, CHiwda, club soda, cool, Dabeli, drink, falafel, mojito, momos, non-alcoholic, pineapple, seltezer water, shweta jindal, summer, tropical, veg sizzlers, virgin, zindagisikhati.